Emily Dickinson & Walt Whitman. 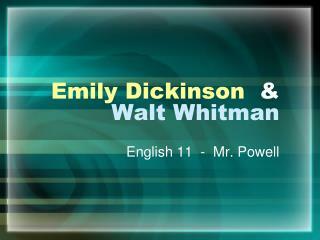 English 11 - Mr. Powell. Two Transitional Writers. 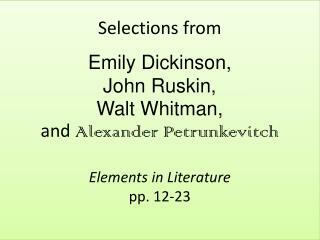 Emily Dickinson and Walt Whitman are included in the Romantic Period in our textbook. Yet they could also be placed comfortably in the post-Civil War era of American Realism. 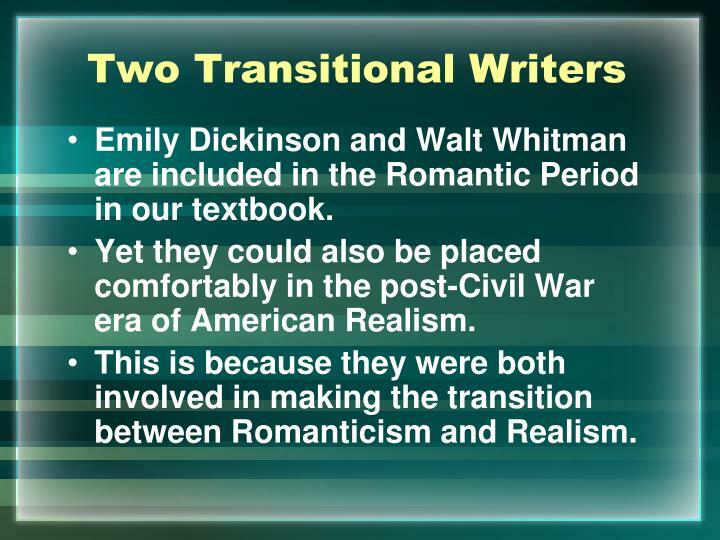 Emily Dickinson and Walt Whitman are included in the Romantic Period in our textbook. Yet they could also be placed comfortably in the post-Civil War era of American Realism. This is because they were both involved in making the transition between Romanticism and Realism. 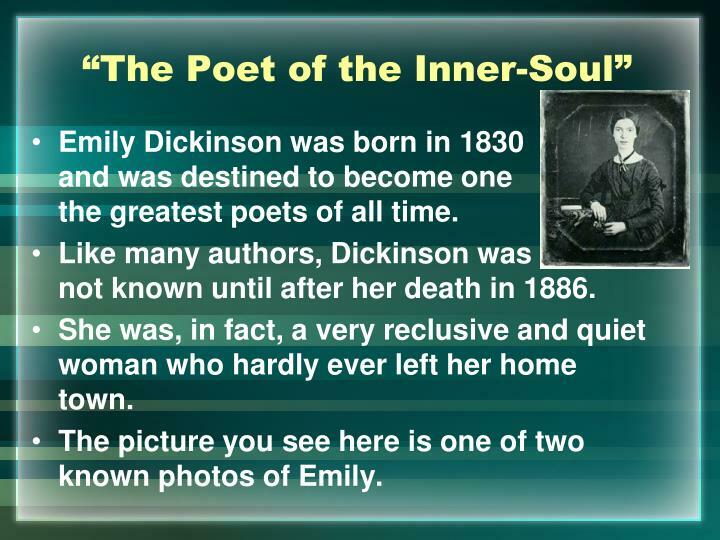 Emily Dickinson was born in 1830 and was destined to become one of the greatest poets of all time. 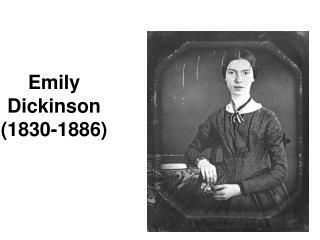 Like many authors, Dickinson was not known until after her death in 1886. She was, in fact, a very reclusive and quiet woman who hardly ever left her home town. 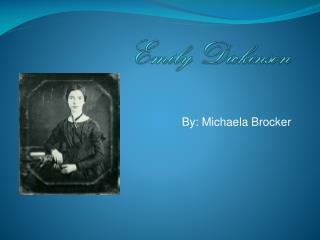 The picture you see here is one of two known photos of Emily. 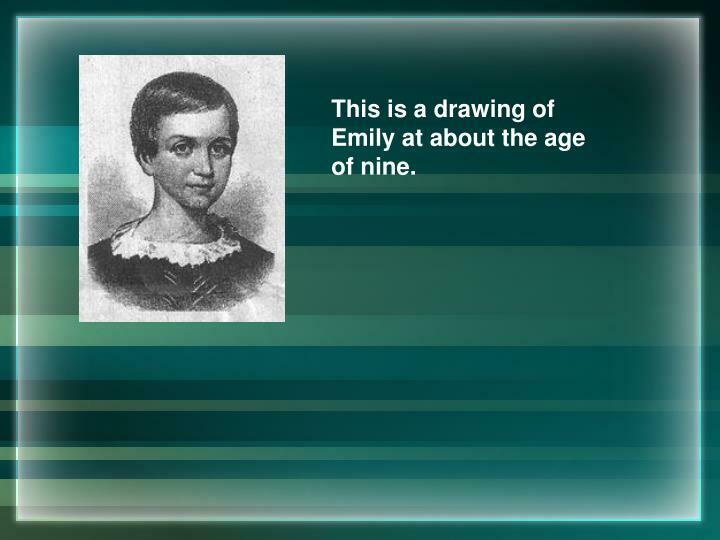 This is a drawing of Emily at about the age of nine. 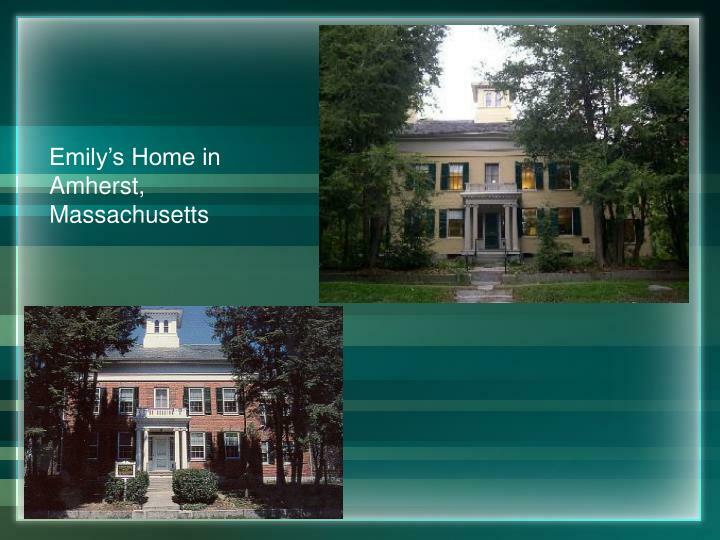 Amherst, Massachusetts was a quiet New-England town when Emily was born there. Amherst is now known for the very fine Amherst College that is located there. 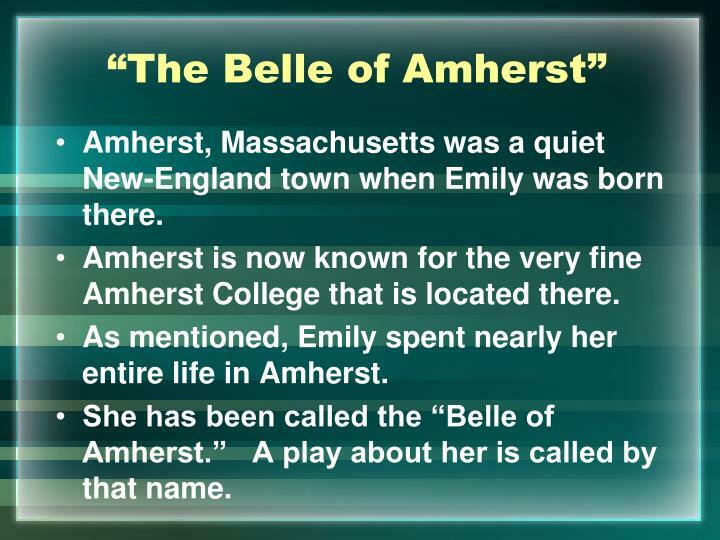 As mentioned, Emily spent nearly her entire life in Amherst. She has been called the “Belle of Amherst.” A play about her is called by that name. 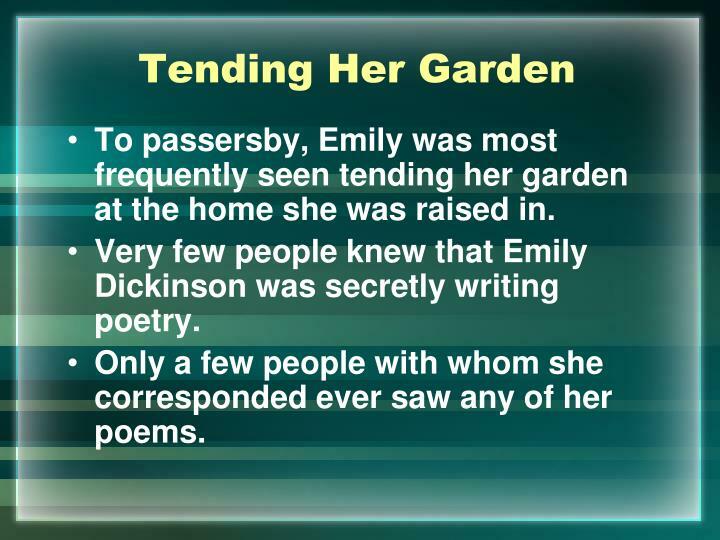 To passersby, Emily was most frequently seen tending her garden at the home she was raised in. 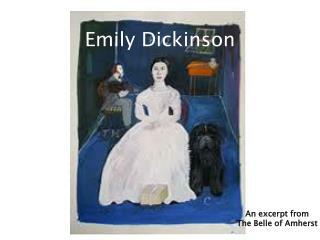 Very few people knew that Emily Dickinson was secretly writing poetry. 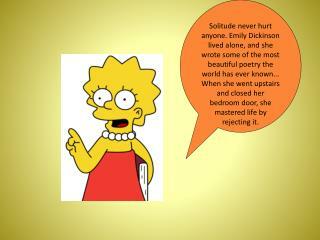 Only a few people with whom she corresponded ever saw any of her poems. 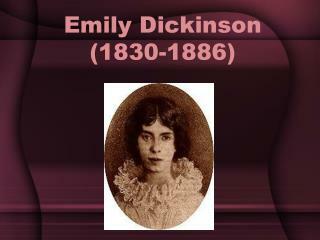 During her lifetime, only seven poems of Emily Dickinson’s were published. 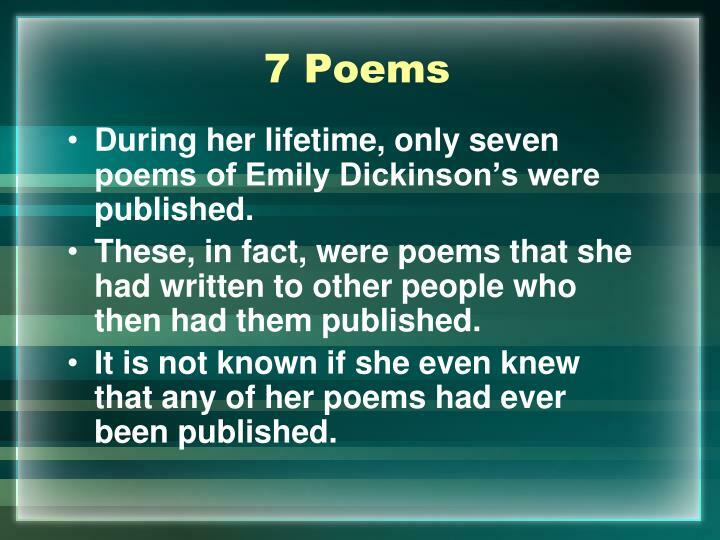 These, in fact, were poems that she had written to other people who then had them published. 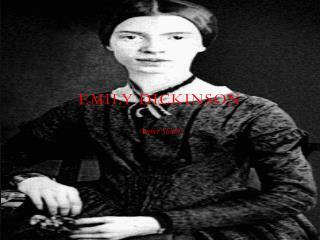 It is not known if she even knew that any of her poems had ever been published. 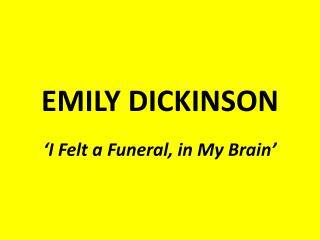 Emily’s sheltered life may have been the result of the death of family members and friends. 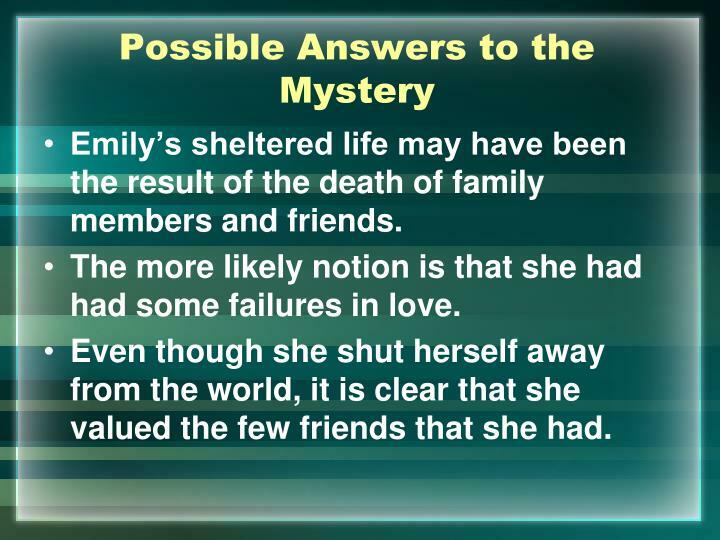 The more likely notion is that she had had some failures in love. Even though she shut herself away from the world, it is clear that she valued the few friends that she had. 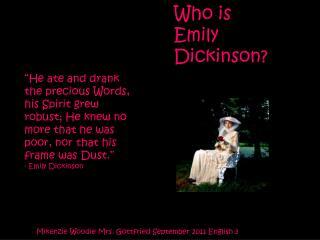 The question of Emily’s sexual feelings has been a subject of a lot of recent writings. But her sister-in-law, Susan Gilbert, to whom she wrote hundreds of letters, might have also been a love interest. 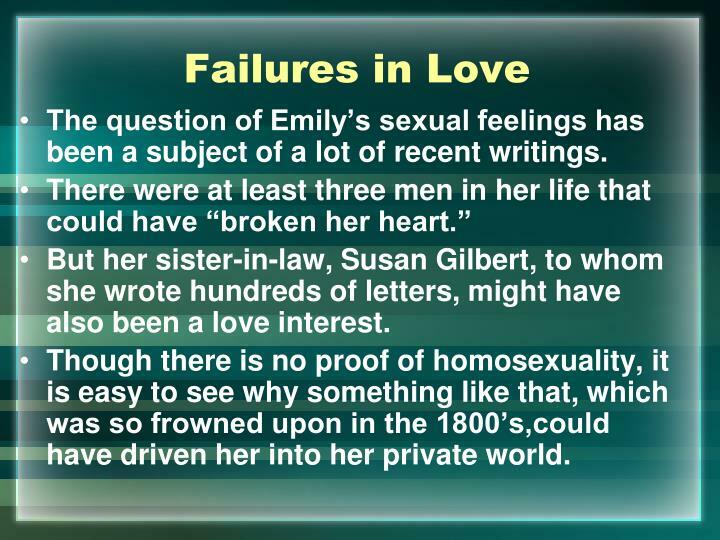 Though there is no proof of homosexuality, it is easy to see why something like that, which was so frowned upon in the 1800’s,could have driven her into her private world. 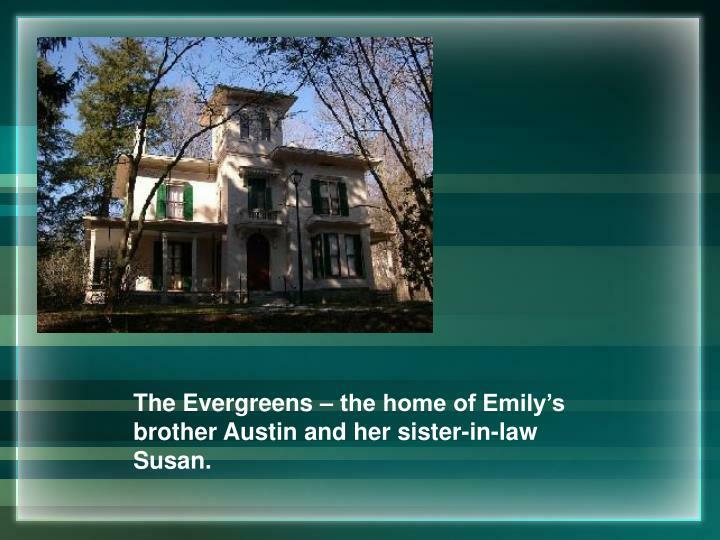 The Evergreens – the home of Emily’s brother Austin and her sister-in-law Susan. 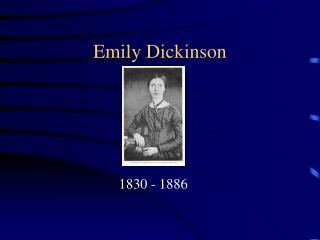 Emily was educated at Amherst Academy which had started taking female students two years before she enrolled. The she entered Mount Holyoke Female Seminary. The founder, Mary Lyon, ranked students of the basis of those who would receive God’s grace, those who had some hope, and those who had no hope at all. 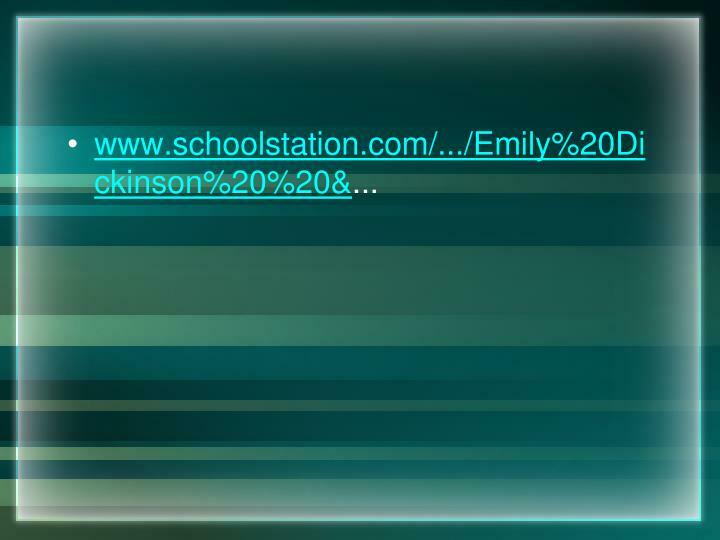 She placed Emily in the last category. 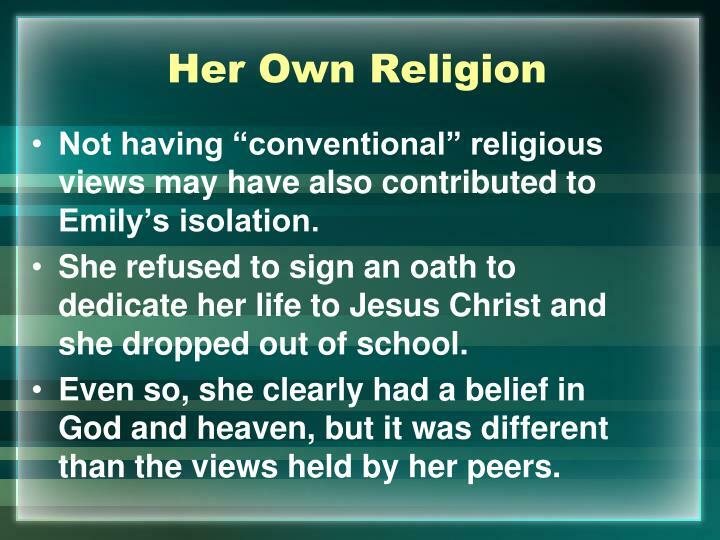 Not having “conventional” religious views may have also contributed to Emily’s isolation. She refused to sign an oath to dedicate her life to Jesus Christ and she dropped out of school. Even so, she clearly had a belief in God and heaven, but it was different than the views held by her peers. 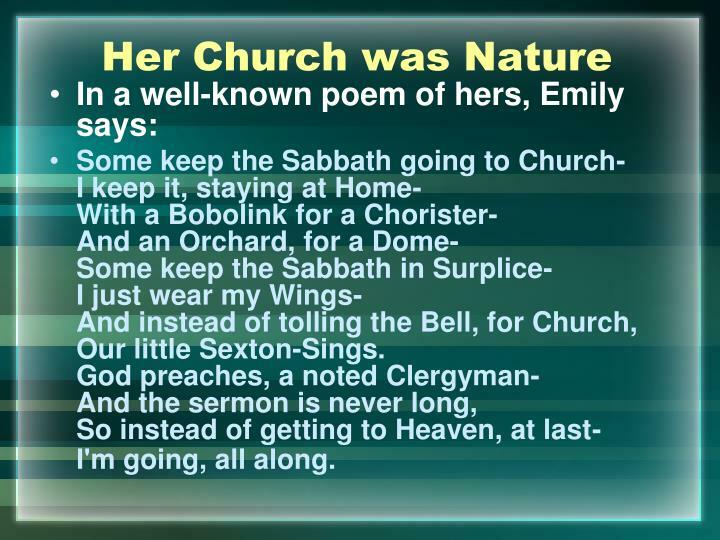 Some keep the Sabbath going to Church- I keep it, staying at Home- With a Bobolink for a Chorister- And an Orchard, for a Dome- Some keep the Sabbath in Surplice- I just wear my Wings- And instead of tolling the Bell, for Church, Our little Sexton-Sings. God preaches, a noted Clergyman- And the sermon is never long, So instead of getting to Heaven, at last- I'm going, all along. Her father, a lawyer, to whom she was very close was probably the model for what she looked for in male friendship. His death was a devastating loss. 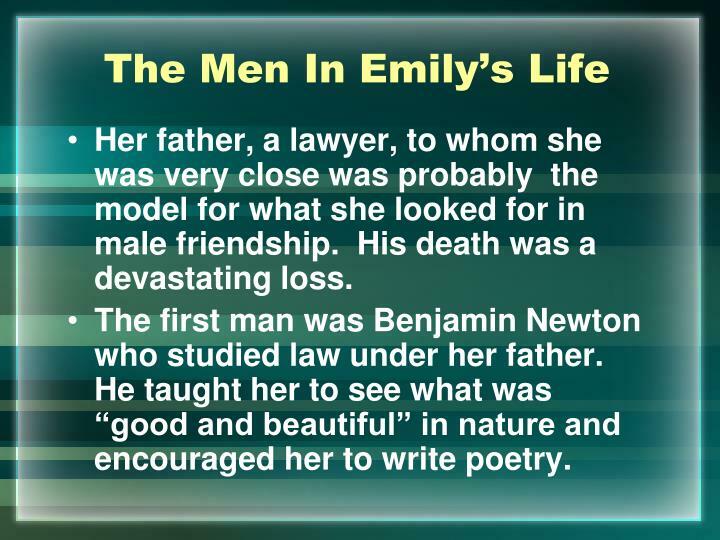 The first man was Benjamin Newton who studied law under her father. He taught her to see what was “good and beautiful” in nature and encouraged her to write poetry. 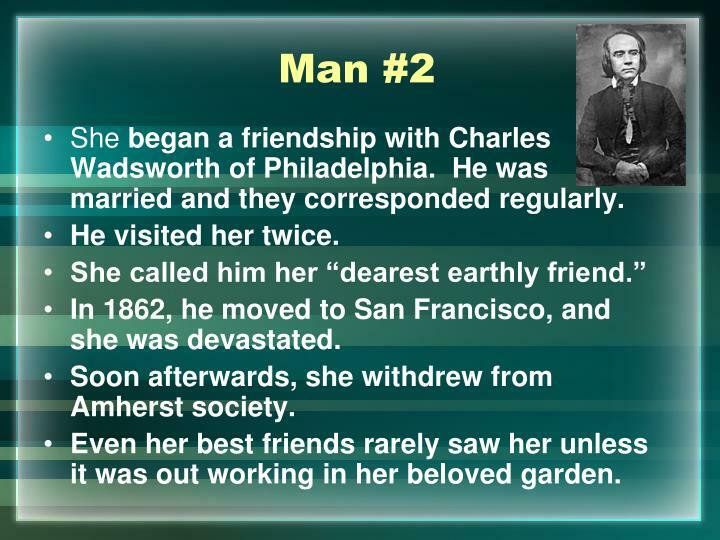 She began a friendship with Charles Wadsworth of Philadelphia. He was married and they corresponded regularly. In 1862, he moved to San Francisco, and she was devastated. Soon afterwards, she withdrew from Amherst society. Even her best friends rarely saw her unless it was out working in her beloved garden. 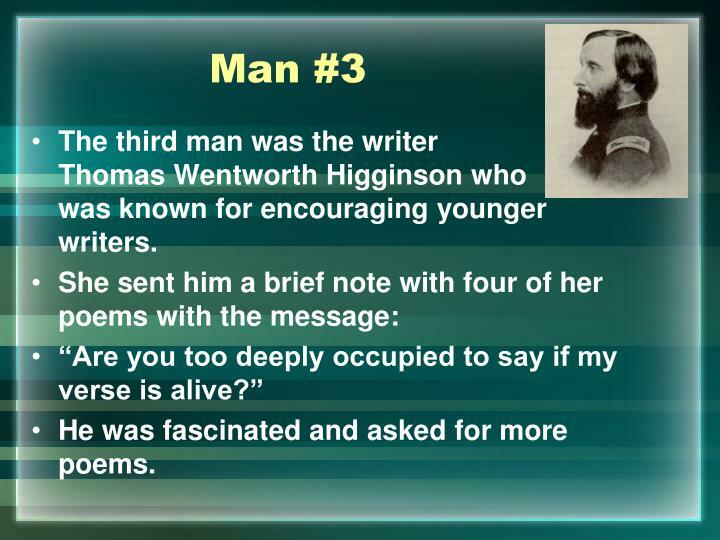 The third man was the writer Thomas Wentworth Higginson who was known for encouraging younger writers. He was fascinated and asked for more poems. 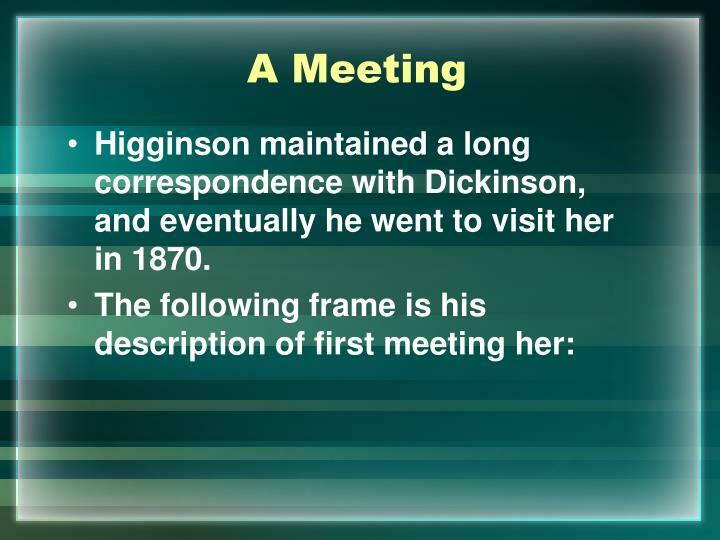 Higginson maintained a long correspondence with Dickinson, and eventually he went to visit her in 1870. 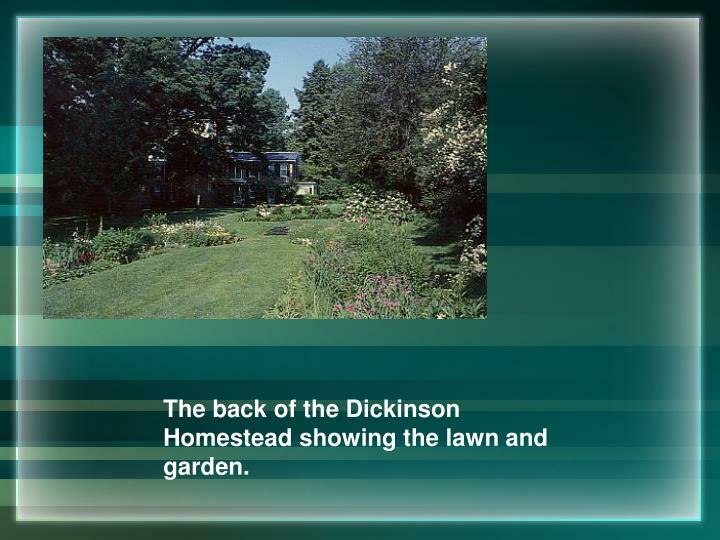 The back of the Dickinson Homestead showing the lawn and garden. 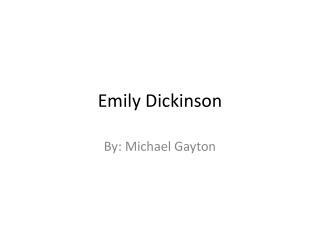 Emily probably wanted to have her poems published but on her own terms, and it seemed that publishers were unwilling to take a risk with them—they were very unconventional at the time. 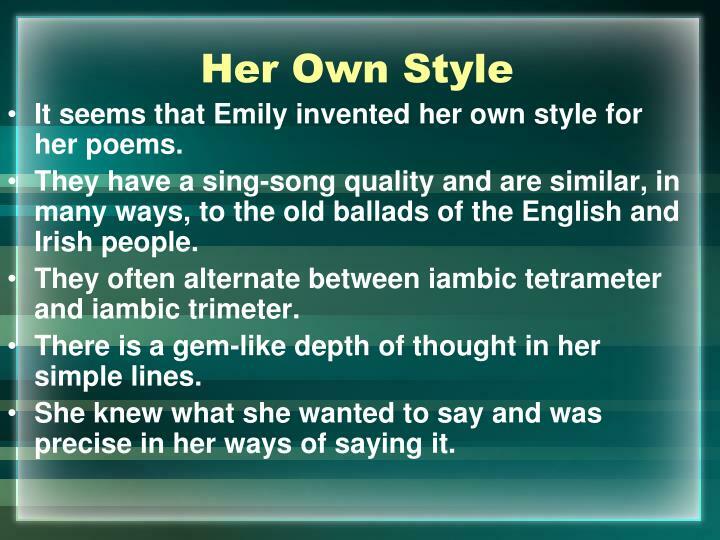 It seems that Emily invented her own style for her poems. 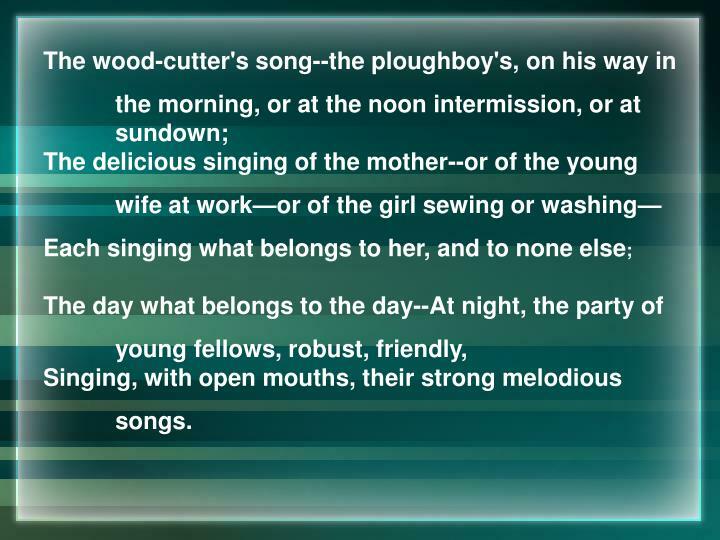 They have a sing-song quality and are similar, in many ways, to the old ballads of the English and Irish people. 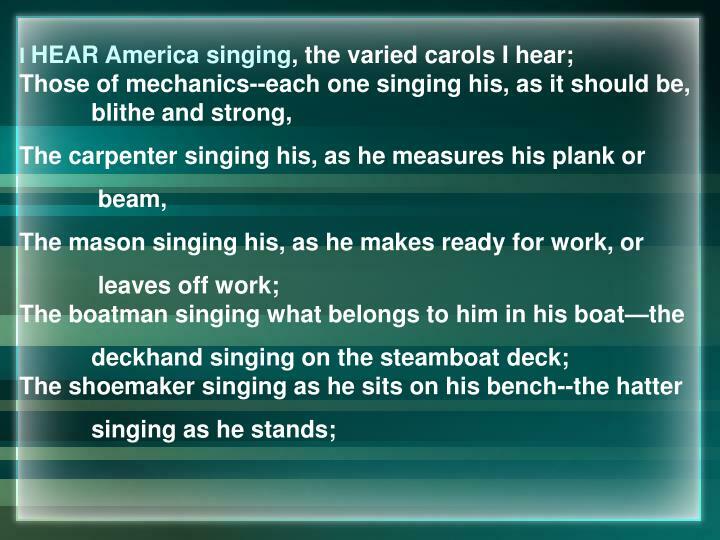 They often alternate between iambic tetrameter and iambic trimeter. There is a gem-like depth of thought in her simple lines. She knew what she wanted to say and was precise in her ways of saying it. 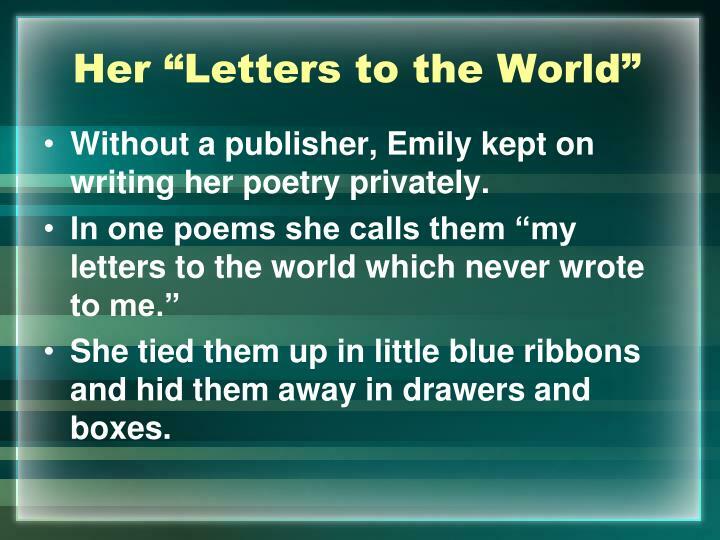 Without a publisher, Emily kept on writing her poetry privately. She tied them up in little blue ribbons and hid them away in drawers and boxes. 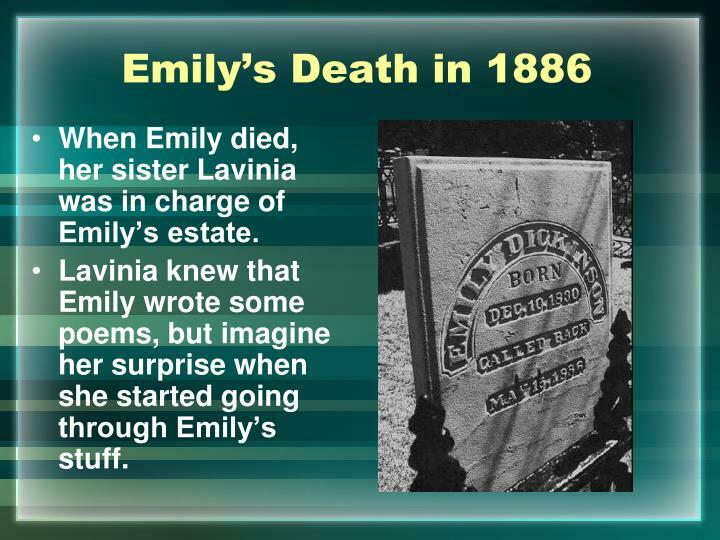 When Emily died, her sister Lavinia was in charge of Emily’s estate. Lavinia knew that Emily wrote some poems, but imagine her surprise when she started going through Emily’s stuff. 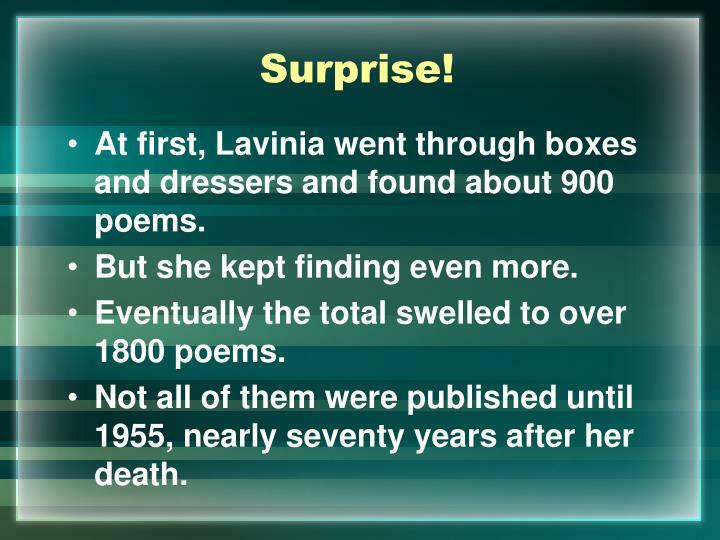 At first, Lavinia went through boxes and dressers and found about 900 poems. But she kept finding even more. Eventually the total swelled to over 1800 poems. 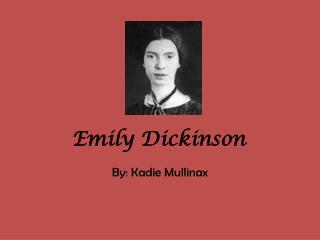 Not all of them were published until 1955, nearly seventy years after her death. 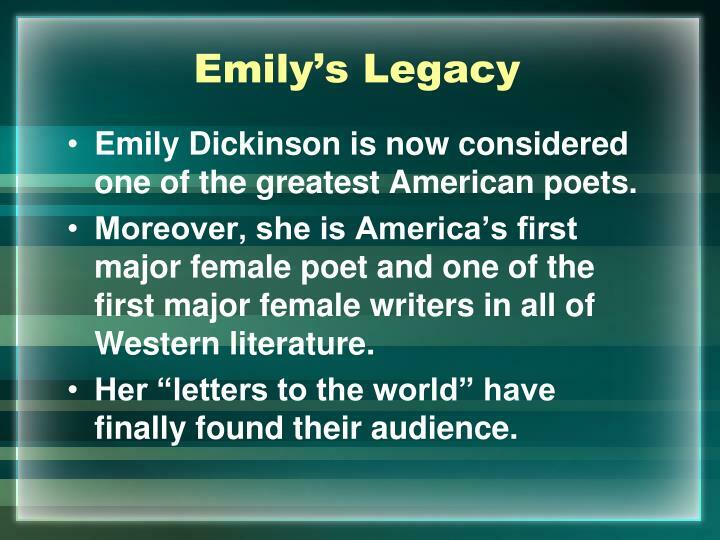 Emily Dickinson is now considered one of the greatest American poets. 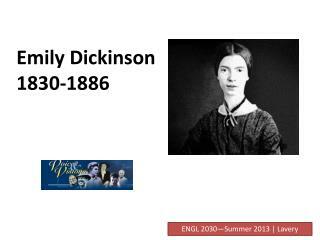 Moreover, she is America’s first major female poet and one of the first major female writers in all of Western literature. Her “letters to the world” have finally found their audience. 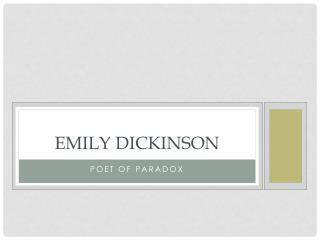 If Emily Dickinson is one of America’s great poets, she has to share the spotlight with Walt Whitman. 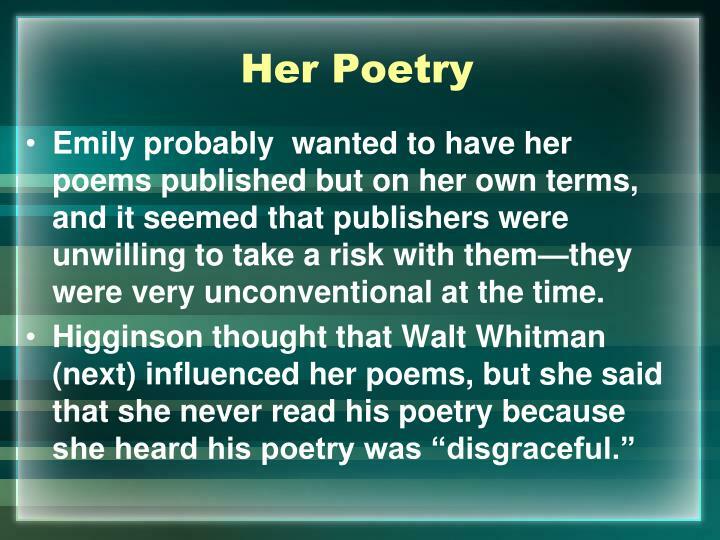 Whitman may have changed the course of poetry more than any other single person. Almost single handedly, he invented free verse, the poetry of no rhythm and rhyme that had dominated the last century. 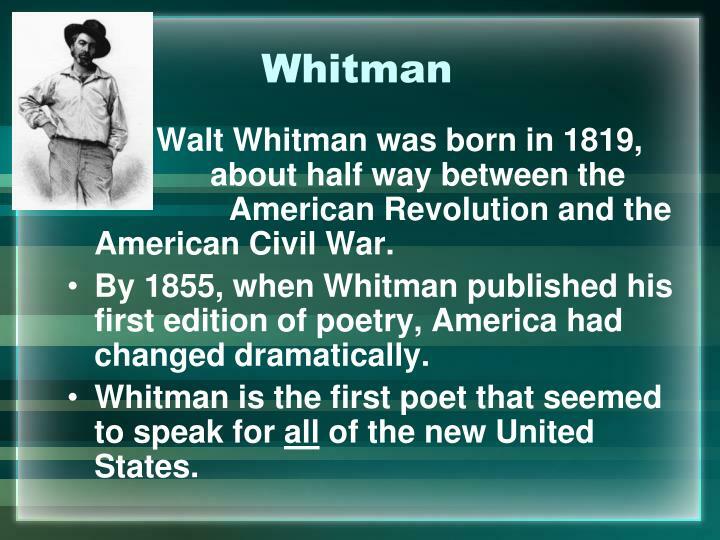 Walt Whitman was born in 1819, about half way between the American Revolution and the American Civil War. By 1855, when Whitman published his first edition of poetry, America had changed dramatically. 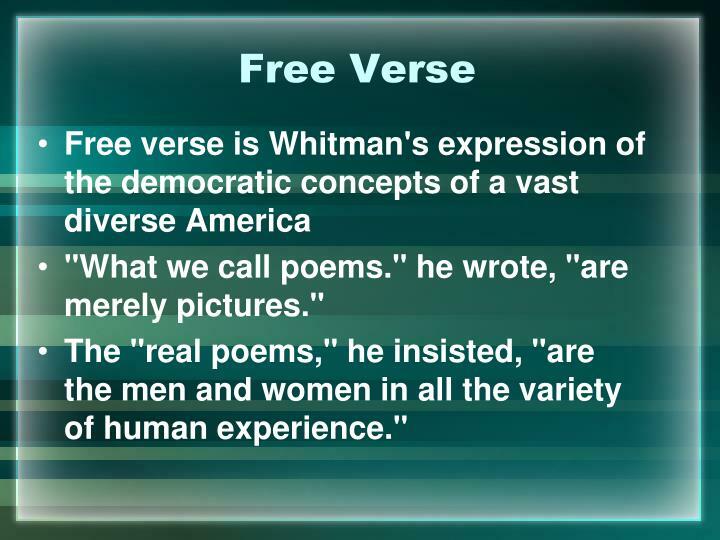 Whitman is the first poet that seemed to speak for all of the new United States. In 1783, the new country was a group of 13 new states clustered along the Atlantic coastline. 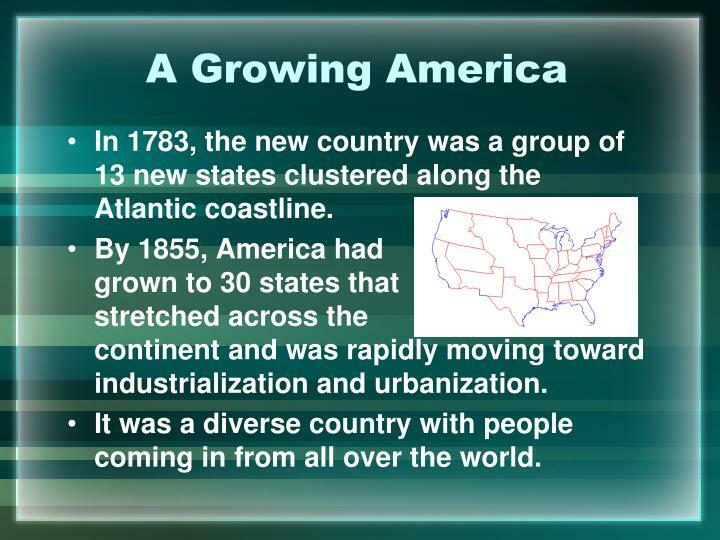 By 1855, America had grown to 30 states that stretched across the continent and was rapidly moving toward industrialization and urbanization. It was a diverse country with people coming in from all over the world. 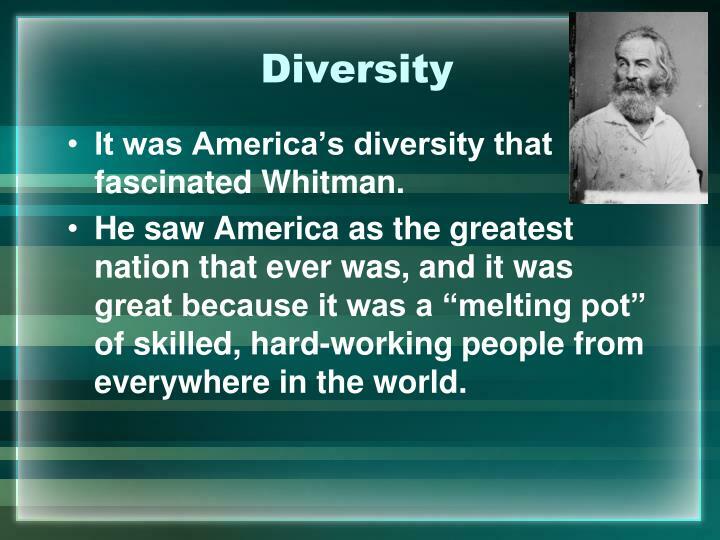 It was America’s diversity that fascinated Whitman. He saw America as the greatest nation that ever was, and it was great because it was a “melting pot” of skilled, hard-working people from everywhere in the world. 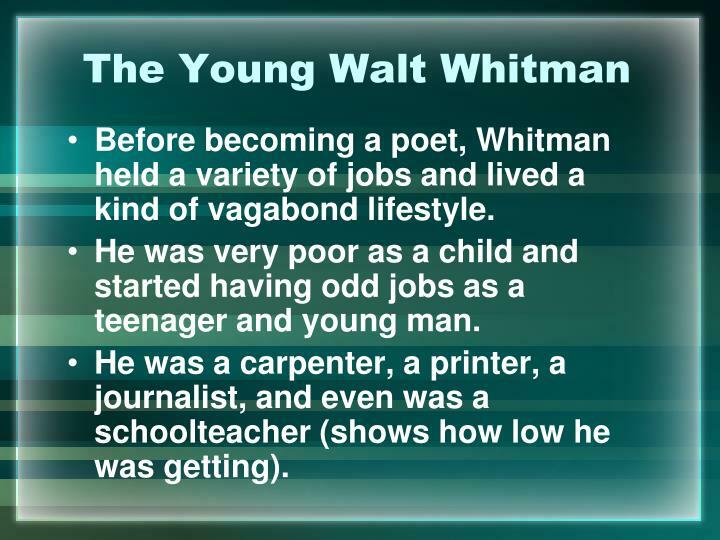 Before becoming a poet, Whitman held a variety of jobs and lived a kind of vagabond lifestyle. He was very poor as a child and started having odd jobs as a teenager and young man. He was a carpenter, a printer, a journalist, and even was a schoolteacher (shows how low he was getting). 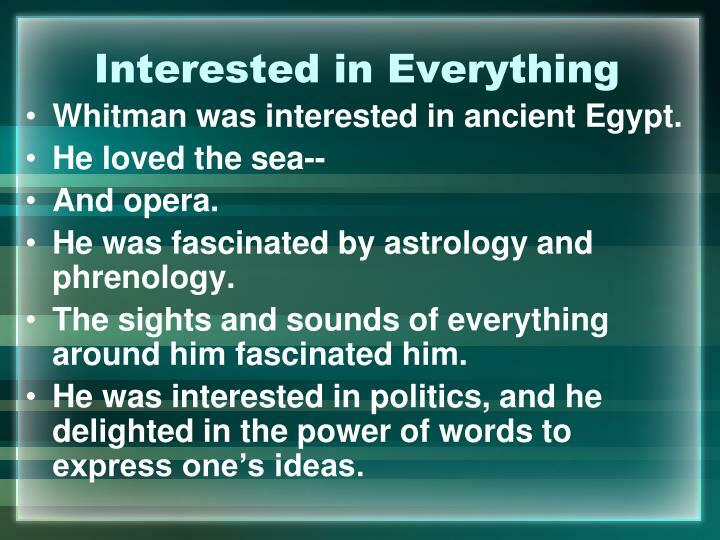 Whitman was interested in ancient Egypt. He was fascinated by astrology and phrenology. The sights and sounds of everything around him fascinated him. He was interested in politics, and he delighted in the power of words to express one’s ideas. When he turned to writing poetry, Whitman had already lived a fuller life than many people live in a lifetime. He saw poetry as organic—growing naturally like flowers and other plants grow. 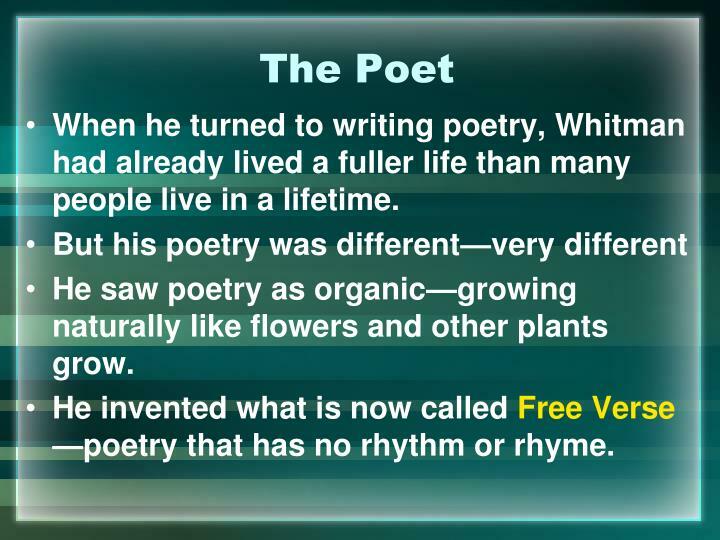 He invented what is now called Free Verse —poetry that has no rhythm or rhyme. 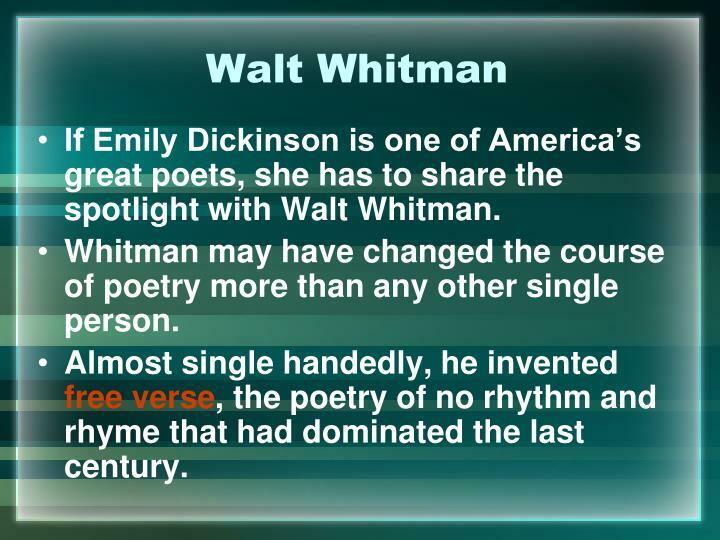 Until Whitman, poetry had always had rhythm and rhyme. Most people who saw his poetry found it too weird, and many would not even consider it poetry. 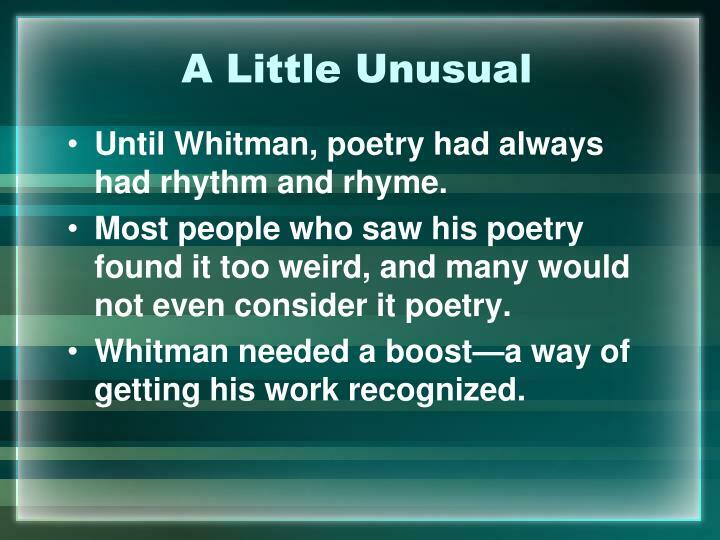 Whitman needed a boost—a way of getting his work recognized. 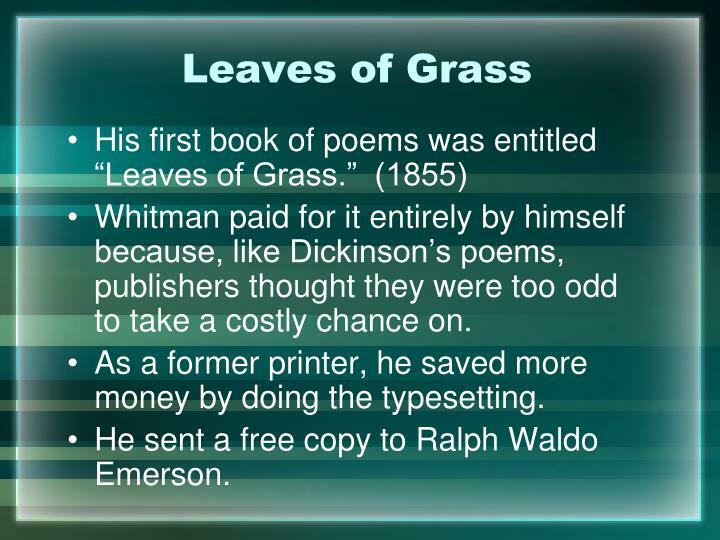 Whitman paid for it entirely by himself because, like Dickinson’s poems, publishers thought they were too odd to take a costly chance on. As a former printer, he saved more money by doing the typesetting. He sent a free copy to Ralph Waldo Emerson. Emerson was considered America’s greatest thinker and was an unlikely person to back Whitman’s new style of poetry. Yet Emerson was entranced by the poems and responded with a five-page reply. It became the most famous piece of literary sponsorship in American history. 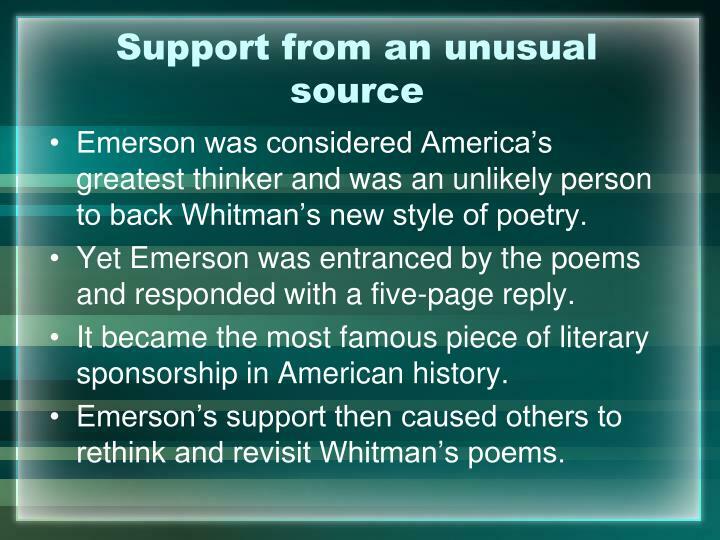 Emerson’s support then caused others to rethink and revisit Whitman’s poems. “I greet you at the beginning of a great career, which yet must have had a long foreground somewhere for such a start. 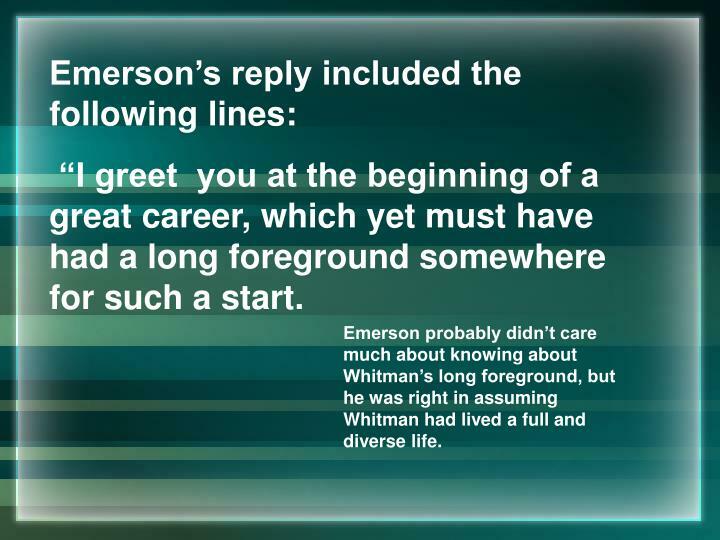 Emerson probably didn’t care much about knowing about Whitman’s long foreground, but he was right in assuming Whitman had lived a full and diverse life. "What we call poems." he wrote, "are merely pictures." The "real poems," he insisted, "are the men and women in all the variety of human experience." 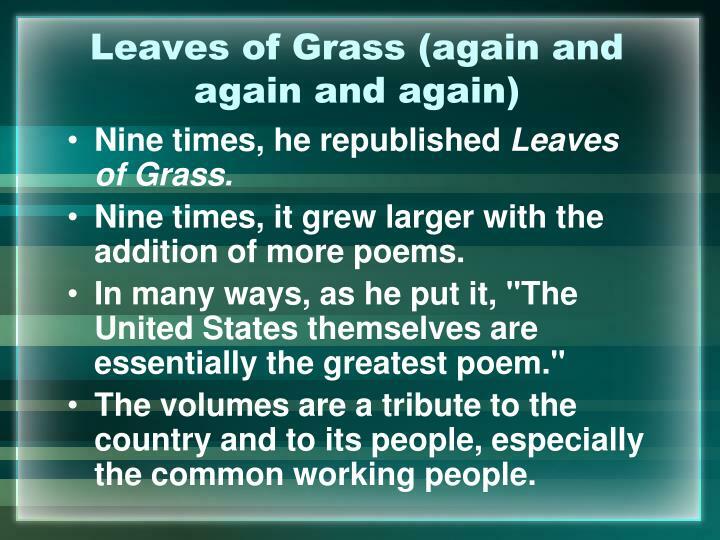 Nine times, he republished Leaves of Grass. Nine times, it grew larger with the addition of more poems. In many ways, as he put it, "The United States themselves are essentially the greatest poem." The volumes are a tribute to the country and to its people, especially the common working people. 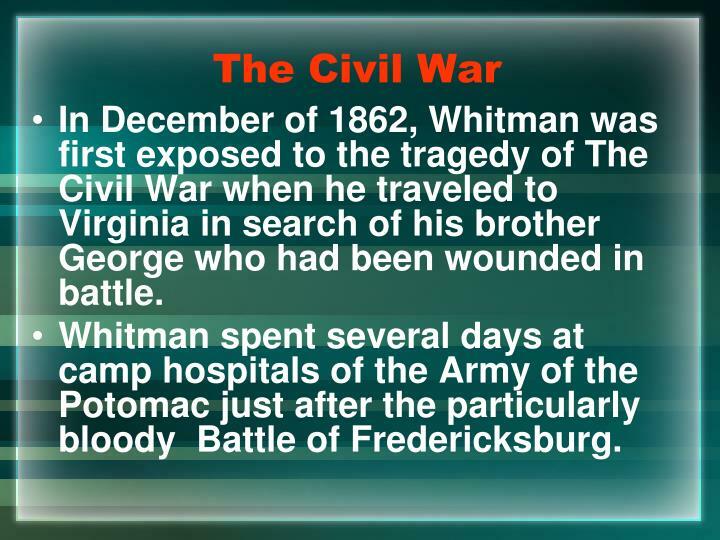 In December of 1862, Whitman was first exposed to the tragedy of The Civil War when he traveled to Virginia in search of his brother George who had been wounded in battle. 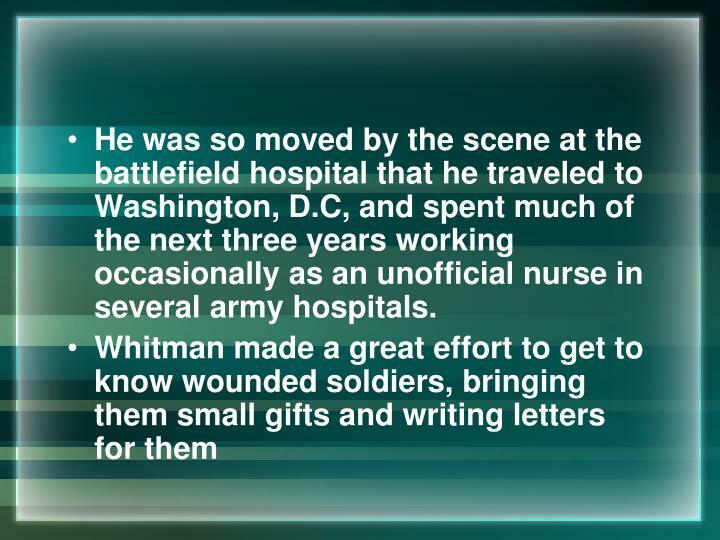 Whitman spent several days at camp hospitals of the Army of the Potomac just after the particularly bloody Battle of Fredericksburg. He was so moved by the scene at the battlefield hospital that he traveled to Washington, D.C, and spent much of the next three years working occasionally as an unofficial nurse in several army hospitals. Whitman was also a great admirer of Lincoln. 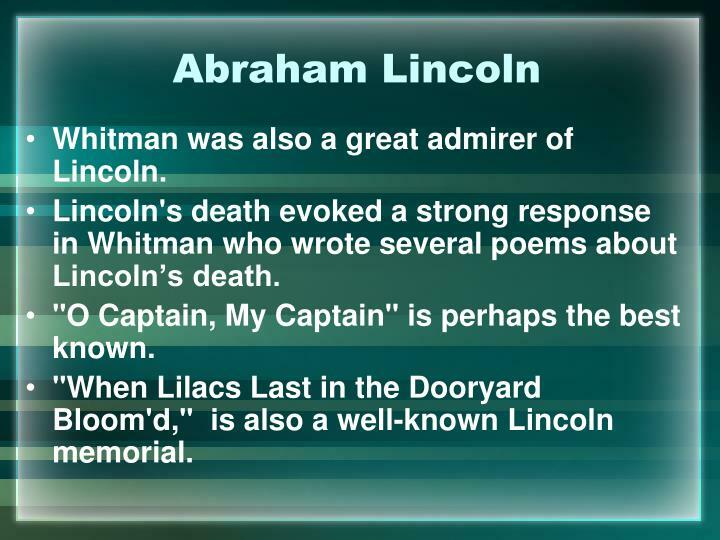 Lincoln's death evoked a strong response in Whitman who wrote several poems about Lincoln’s death. "O Captain, My Captain" is perhaps the best known. "When Lilacs Last in the Dooryard Bloom'd," is also a well-known Lincoln memorial. 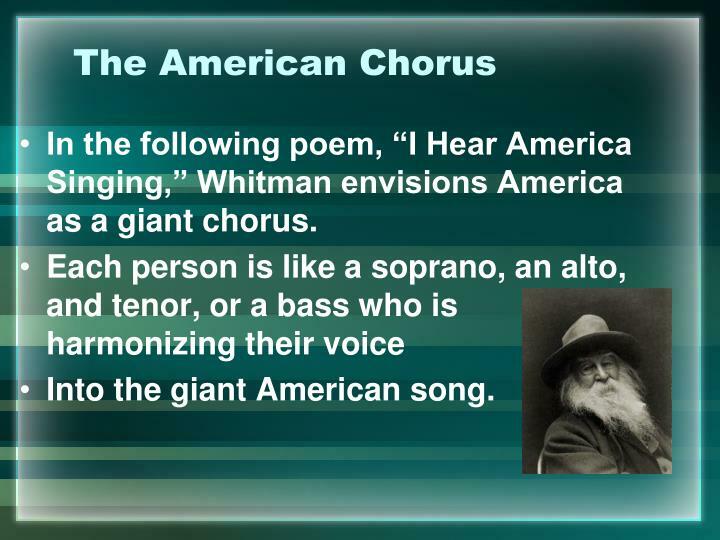 In the following poem, “I Hear America Singing,” Whitman envisions America as a giant chorus. Into the giant American song. 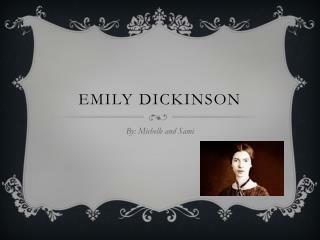 Emily Dickinson (1830-1886) -. life. 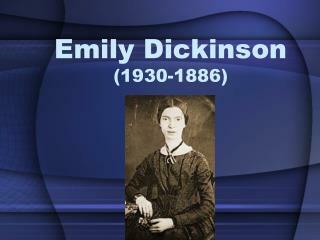 born (dec 1830) and died (may 1886) in amherst, mass. strongly attached to her family (brother austin and sister lavinia, vinnie). http://en.wikipedia.org/wiki/file:dickinson_children_painting.jpeg. life. 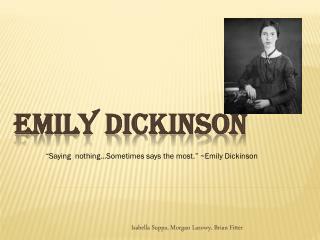 Emily Dickinson -. 1830 - 1886. early life. 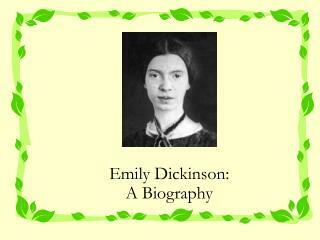 she was born to religious, well-to-do family and had a normal childhood in amherst, massachusetts. everyone expected her to marry and raise a family like most women of her class. 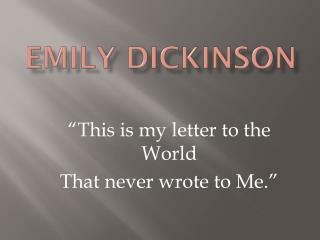 EMILY DICKINSON -. ‘i felt a funeral, in my brain’. 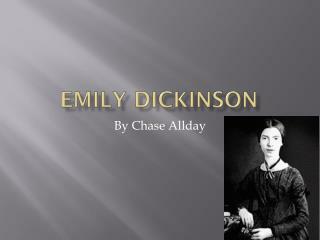 Emily Dickinson -. 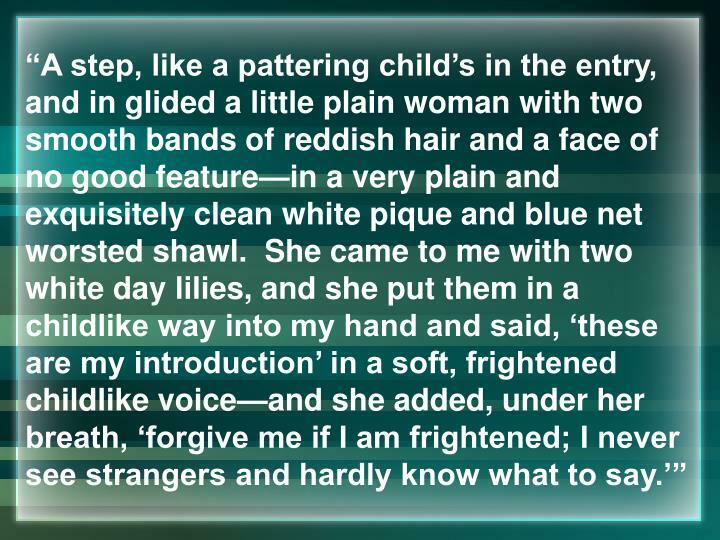 a a. an excerpt from the belle of amherst. forgive me if i’m frightened. i never see strangers and hardly know what i say. my sister, lavinia —she’s younger than i—she says i tend to wander back and forth in time. 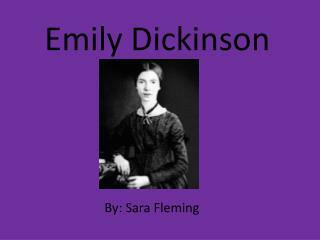 Emily Dickinson -. amber shields .